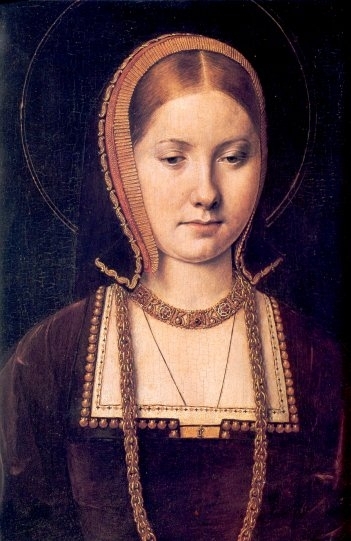 Catherine of Aragon, the youngest daughter of King Ferdinand II of Aragon and Isabella I of Castile, became the central figure in a domestic drama that would permanently rupture relations between England and Rome. After an early marriage to Arthur, prince of Wales, who died of illness, Catherine married again in 1509, this time to his brother, King Henry VIII of England. By 1527, the union had not yet produced a male heir, and Henry sought an annulment on the grounds that the marriage had violated a biblical injunction against a man marrying his brother’s widow. Thus began Catherine’s seven-year struggle to maintain her position as queen of England. While Henry and his counselors beseiged the pope with scholarly arguments in favor of the annulment, Catherine undercut those arguments by claiming that her marriage to Arthur had never been consummated and, therefore, her marriage to Henry did not constitute a breach of canon law. In 1531, as the case dragged on, Catherine was effectively banished from court. Henry finally circumvented the pope. In 1533, he married Anne Boleyn, the archbishop of Canterbury annulled his marriage to Catherine, papal authority over England was abolished in the Act of Supremacy, and Henry became head of the English church. Catherine ended her days in isolation at Huntingdonshire.